Climate Change – What will happen after the decisions in Paris? | Climate Change – What will happen after the decisions in Paris? The impacts of climate change place future human prosperity and wellbeing at risk. Despite much progress in the development of alternatives to fossil fuel energy, continuing growth in population and global economic activity have overwhelmed attempts to reduce human carbon emissions. What is needed to avoid ‘dangerous’ climate change is the ‘greatest collective action in history’. The forthcoming United Nations Climate Change Conference in Paris, to be held in December 2015, is the latest in a series of negotiations aimed at achieving a global accord. We all need to participate in the public discussion and take action to ensure that the world adopts a path to a more secure, green and clean future. 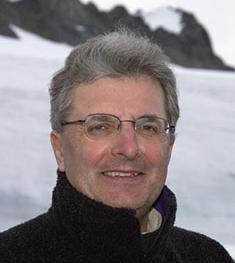 Chris Rapley is Professor of Climate Science at UCL and is the Chair of European Space Agency Director General’s High Level Science Policy Advisory Committee. He performed the play on climate change ‘2071’, which he wrote with Duncan Macmillan, at the Royal Court theatre in London, the Deutsches Schauspielhaus in Hamburg, and the BOZAR theatre in Brussels. 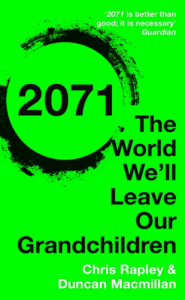 The book ‘2071 – The World We’ll Leave Our Grandchildren’ is available, published by John Murray. This entry was posted in 2015, Audio and tagged Chris Rapley. Bookmark the permalink.